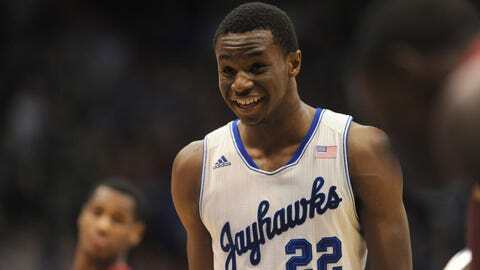 Jan 29, 2014; Lawrence, KS, USA; Kansas Jayhawks guard Andrew Wiggins (22) laughs before shooting a free throw during the second half against the Iowa State Cyclones at Allen Fieldhouse. Kansas won 92 - 81. LAWRENCE, Kan. (AP) — Just minutes after Andrew Wiggins put No. 6 Kansas on his back, scoring six of his career-high 29 points in the defining moment of the game, Iowa State coach Fred Hoiberg offered a glowing assessment of the star freshman. "You can tell he’s oozing with confidence," Hoiberg said Wednesday night after his 16th-ranked Cyclones lost 92-81, "and that’s scary." The nation’s No. 1 recruit, Wiggins has finally started to live up to his hype. He matched his 27-point performance in a win over TCU last weekend with a dunk that gave Kansas an 81-72 lead with just under 3 minutes remaining, and then added a couple free throws for his career high. The freshman hit four 3-pointers and finished 10 of 16 from the field. "I’m just starting to feel more comfortable," Wiggins said. It helped that he didn’t have to carry the load himself. Perry Ellis added 20 points, Joel Embiid had 14 points and 11 rebounds, and Naadir Tharpe finished with 12 points and 12 assists for the Jayhawks (16-4, 7-0 Big 12), who won their seventh straight game. Wayne Selden had 11 points and five assists. "I’m not surprised at all because we got prepared to play these games," Tharpe said. "It was a matter of time until everyone just went out there and started to play." Georges Niang led the Cyclones (15-4, 3-4) with 24 points. DeAndre Kane added 22 points and Melvin Ejim, battling foul trouble much of the game, finished with 18 points and eight rebounds. Iowa State started the season with 14 straight wins, but has now dropped four of its last five. That includes a 77-70 loss to the Jayhawks earlier this month in Ames. "If they’re hitting shots like that," Hoiberg said of the Jayhawks, "that’s going to be a tough, tough team to beat." It didn’t seem to matter early in the game. The comeback began with a jam off an alley-oop pass by Ejim, and picked up momentum when the Cyclones hit 3-pointers on four straight trips down court. By the time Monte Morris finished off the run, done mostly while Wiggins sat on the bench, the lead had been trimmed to 37-34. "I’ve been in this building enough as a player, as a coach, a scout, and it happens pretty much every game, they come out and hit shots early and you have to withstand it, you have to withstand the runs," Hoiberg said. "I give our guys credit for clawing back in the game." By that point, a packed crowd that included Kansas City Royals Billy Butler and Jeremy Guthrie and Grammy nominated musician Trey Songz was on its feet. Embiid responded with a thunderous dunk, and after Kane turned it over at the other end, the Cyclones intentionally fouled Wiggins on a fast break. He made both free throws, and then added a putback off Embiid’s miss to make it a four-point trip. "That was a pretty big call," Niang said of the intentional foul. "Not saying it was a bad call or anything, but that’s where they took off." Wiggins added a run-out dunk after another turnover to give the Jayhawks an 81-72 lead, and the defending Big 12 champions coasted the rest of the way to its 18th win in 19 meetings with Iowa State. "We gave ourselves a chance," Hoiberg said, "and at the end of the day, we gave ourselves an opportunity in as tough an environment as we’re going to play in."